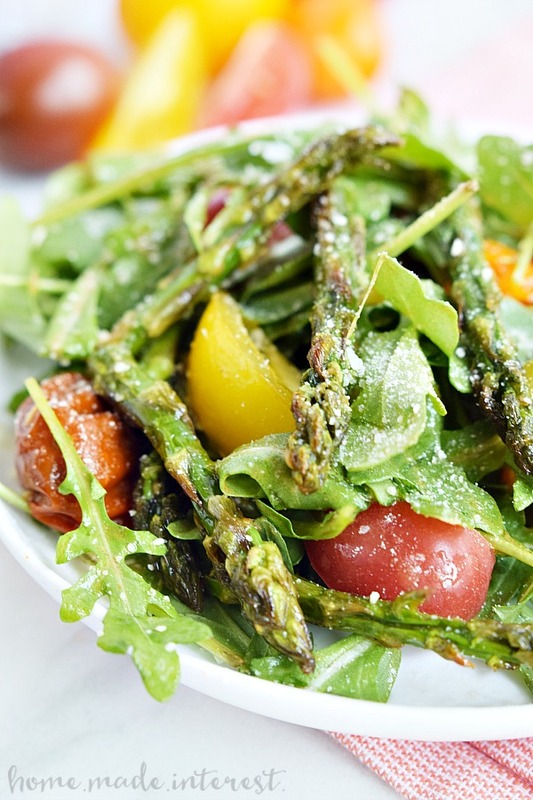 Roasted Tomato and Asparagus Salad - Home. Made. Interest. This simple Roasted Tomato and Asparagus Salad recipe is tossed in a simple balsamic vinaigrette. It makes a simple healthy lunch, or a great side for a light dinner. So, I have to admit, side dishes are one of the hardest things for me to come up with. I can think of awesome dinner ideas with no problem but coming up with a side dish that isn’t just the same old rice or potatoes recipe I’ve been eating all my life is tough. I love fresh vegetables in the summer but I end up just cooking them in a skillet with a little olive oil and salt every night. Tastes great but it isn’t very creative! This pretty salad is a mix of two of my favorite vegetables, asparagus and tomatoes, that have been roasted together with some olive oil and garlic. It’s simple because both vegetables cook really quickly in the oven. I just cut them up and put the in a bowl with some minced garlic and toss them in olive oil and a sprinkle of salt. Then I spread them out on a baking sheet and cook them at 400F for about 10 minutes. The tomatoes get warm and soft and slightly wrinkled, and the asparagus is perfectly cooked with just a little crunch left. I add the roasted vegetables to a spring salad mix and drizzle everything with a simple balsamic vinaigrette made with balsamic vinegar, Dijon mustard, and olive oil. It’s light, and bright and so good! 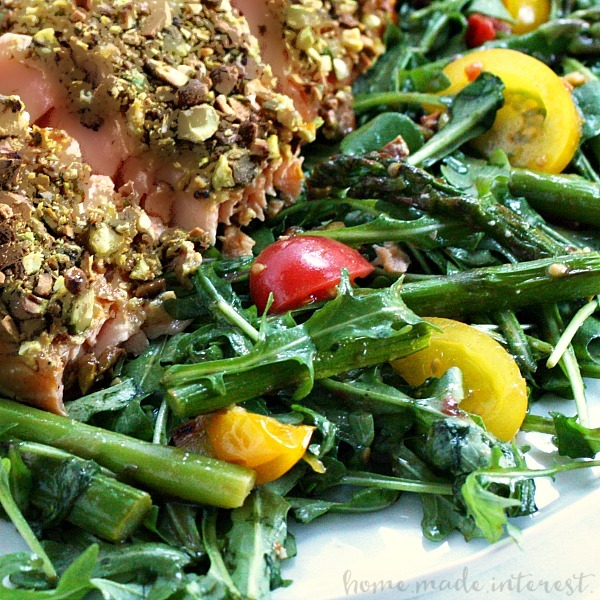 Sometimes I add a little crumbled goat cheese and make it a lunch and other times I serve it for dinner with a simple recipe like my Pistachio Crusted Salmon. It is a great low carb alternative to the rice I would usually serve with a fish dish and my whole family loves it! 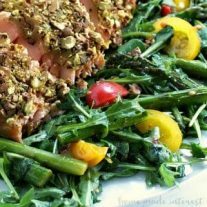 I love making this recipe in the summer and when I have time instead of roasting the vegetables I grill them. A little bit if char on the asparagus adds a whole different flavor that is perfect for a light summer dinner out on the deck. If you try it let me know which one you like better in the comments. That looks so good! 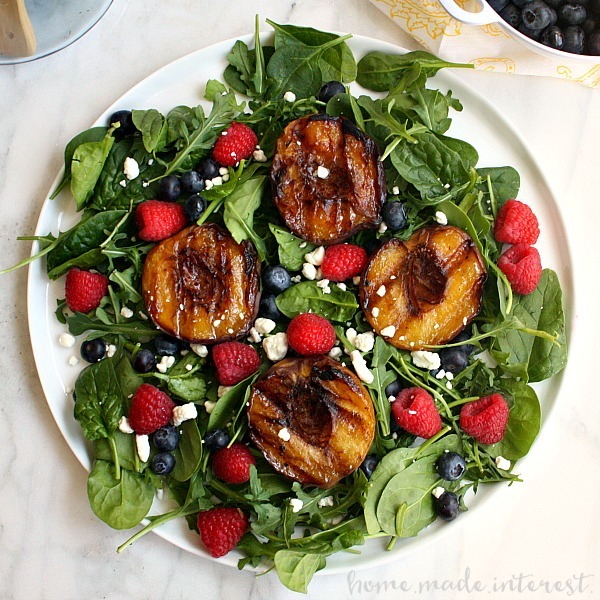 I’m always trying to find new salad recipes, especially in the summer. Thanks for sharing this one! Pinned! Looks delicious! 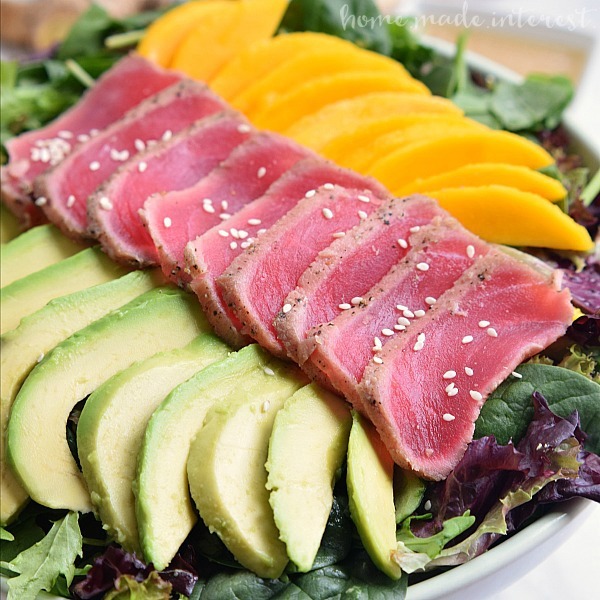 Pinned to share and to refer back to your recipe when I make it this summer.